I hope you're having a great Labor Day weekend. I'm at the Disneyland Resort this weekend, not only for Force Friday--did you get any cool Star Wars Merchandise yesterday?--but also for the 10th anniversary of the Disneyland Half Marathon. My guest in the Lounge today has nothing to do with either of those events, but you're really going to like him. 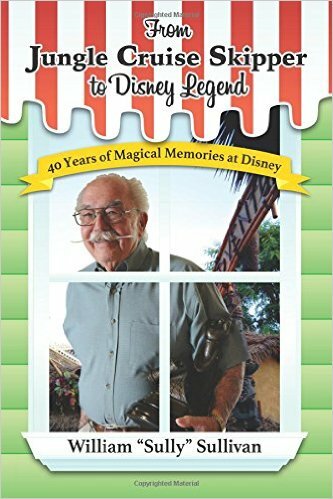 He's Disney Legend Bill "Sully" Sullivan and you're going to hear part two of my conversation with him about his nearly 40 years with Disney. Sully started out as a ticket taker on the Jungle Cruise at Disneyland in 1955 and finished his career in 1994 as vice president of the Magic Kingdom in Florida. Between those times, he got to know both Walt and Roy Disney. He worked at the Winter Olympics in Squaw Valley in 1960 and the New York World's Fair in 1963 and '64. Last week, Sully told us much about those adventures, and in part two of our conversation, he picks things up in October 1971 as Walt Disney World is preparing for its grand opening. Sully also shares some of his fondest memories of both Walt and Roy, as well as the day he got the biggest surprise of his career: the letter from Michael Eisner telling him he'd been named a Disney Legend. It's part two of my conversation with Sully Sullivan in The Mouse Castle Lounge. Enjoy! Sully's book, From Jungle Cruise Skipper to Disney Legend, is available from Amazon.com and ThemeParkPress.com.